What kind of return on investment can you expect with better video collaboration? In this blog, we will examine how video collaboration solutions yield effective in-house communication and excellent client relations. Companies that are moving toward video and away from faceless communication are maximizing their creative output and bringing a competitive advantage to their respective markets. What Did We Do Before Video Collaboration? It was never cool to commute an hour each way to work. It also wasn’t very inspiring to have meetings in those sterile boardrooms or sit behind the walls of a cubicle. But we did it. We wore those pleated pants, and we pressed through the 90’s and 00’s like the little workhorses we thought we had to be. Through it all, the internet gradually became a little faster, the screens clearer, and suddenly, video collaboration was born. 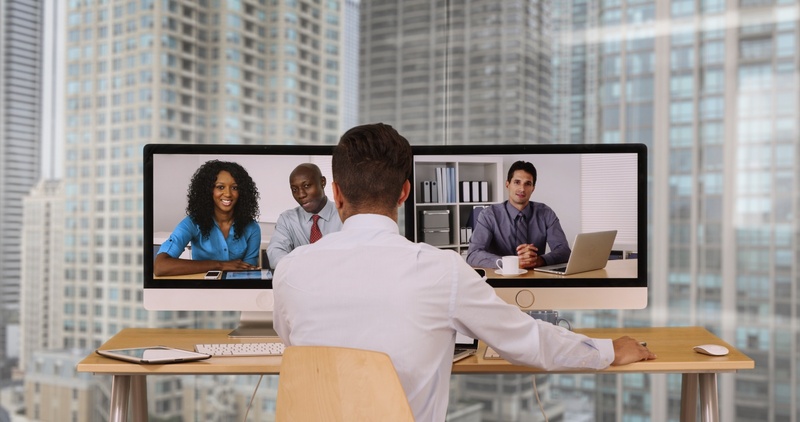 Video collaboration created many possibilities for the 21st century employee, like skipping the traffic and using a laptop at home, all while delivering a productive day “at work”. In the modern workplace, employees work face-to-face with coworkers no matter where they are thanks to the ability to screenshare and collaborate. Your employee’s attention, once lost in email threads, are now whetted for conversation. Video collaboration provides “life” inside the 9-5, and “life” is what people need to perform optimally. When you think about the return on investment for video collaboration, think about your biggest investment - your HUMAN resources. Current and prospective employees want to work for a company that allows them to showcase their skills while providing opportunities for professional growth. Video collaboration allows employees to work and grow more efficiently and effectively, causing their value to increase. Most people would rather not spend an average of 520 hours a year commuting, or more than 2,000 hours a year in an office using email to collaborate. Isn’t there a more effective way to do this so everyone wins? ￼ It is palatable to top talent when they can arrive at a job that is literally hardwired for productivity. It is also mutually beneficial when that job can be worked into the employees’ lifestyle. Video collaboration makes the impossible, possible. It enables employees to work from anywhere, and still meet with team members as though they’re in the same room. While most employees may not want to work remotely every day, video collaboration allows for this flexibility. Video collaboration makes our employees better communicators, and better communicators are exactly who you want to take you to market. Then, there’s the cold call. It was effective in the 80’s (maybe) and has grown increasingly unpopular ever since. Trust with sales and marketing is at an all-time low, and the cold call doesn’t help build trust. Cell phones used to be safe from them, and now they are a target. What does this mean? The companies we would like to do business with know better than to take calls from strangers. If you want to destroy trust immediately with a potential client, we recommend the cold call. It’s awkward, intrusive, and pushy. It’s also faceless. Of course, you also don’t want to be the random incoming video conference on a prospect’s computer screen. With a reliable video collaboration solution, you have a trust-building platform to land on after your non-aggressive email gets a response. How much business do we miss because, to the person with the phone ringing on their desk, it’s just too risky to answer the call? With dependable video conferencing, your sales team can connect with would-be clients without you having to foot the travel expense each time. We want a trust-building, clear method of communication that allows us to connect with our markets at little cost for either party. There is a competitive advantage for companies that have adopted video conferencing into their sales culture. While other companies are confusing their clients with cold calls, the video collaboration company is building face-to-face relationships. Video conferencing allows us to work with clients near and far and puts a face with our name. Face-to-face relationships made possible through video collaboration solutions build trust and boost synergy for employees and clients. The sky's the limit when you can work from home and work with clients from far away, all while still having a crisp conference experience. Think of all the unnecessary money spent on travel when a proper video conference would have been more than enough. Where could you be going as a company with better in-house communication? What would your return on investment be if you implemented a video conferencing solution? What if your competition makes the leap, but you don’t?